Hindolveston postmill had probably been on the same site for several hundred years, although it was certainly rebuilt on more than one occasion. The mill ran a single pair of stones and a flour mill. By the 1800s the mill belonged to the Pegg family and was advertised for sale by Thomas Pegg in 1829, but it remained in the family. By 1839 it had been taken over by John Pegg, who had previously been a miller at Hellesdon and he went on to built Hindolveston_towermill as a replacement for his postmill. After the towermill had been built John Pegg remained there until after 1883, working as miller, baker, shopkeeper and farmer. John Pegg also worked Hunworth_watermill. At the Red Lion at Fakenham, in the County of Norfolk, on Thursday the 23d Day of January, Instant, at Four o'Clock in the Afternoon of that Day, subject to such Conditions of Sale as will be then and there produced. An Estate at Hindolveston, in the said County of Norfolk, consisting of a good Dwelling-House, with Out-offices, and a Garden ready laid out; a Malting-office, Granary, Mill-house, and Mill, Barn, Stable, and other Out-buildings, and fifty Acres, more or less, of good Land, lying together in a Ring Fence adjoining the House, and a Right of Common of a very good and extensive Common, late in the Occupation of Mr James Loose, Farmer and Malster, deceased. This Estate will be sold and conveyed clear of all Incumbrances whatsoever, except the King's Tax and Lord's Rent. For further Particulars apply to Mr Johnson Lee, Attorney, Lynn, Norfolk. To be Lett, and entered upon in April next, situate in Hindolveston, in the County of Norfolk, consisting of a good Dwelling-house, with a Garden before the House neatly laid out, a Malting-Office of about 18 Combs Steep, with a Granary, etc Malt Mill, House, and Mill, Barn, Stable, and proper Buildings, and 53 A. 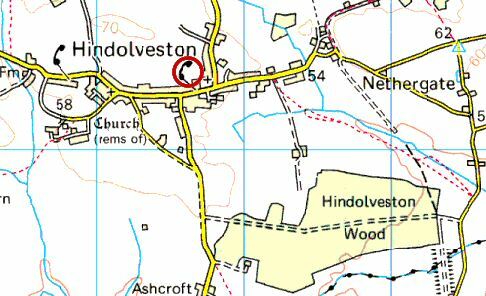 6 P. (more or less) by Measurement, of good Arable and Pasture Land, lying altogether, adjoining to the House, and indisputable Right of Common on the extensive Commons belonging to Hindolveston aforesaid. The above were late in the Occupation of James Loose, deceased. *** Fourteen Acres, Part of the Land, are now sown with wheat. Enquire of Mr Richard Booty, of Binham, Norfolk; of Mr Johnson Lee, Attorney, Lynn; and of Isaac Loose, at the House, who will shew the Premises. When Robert and Edmund [Nurse] emigrated in 1849, the farm and mill were purchased at auction by their eldest brother James (born 1793) in Weybourne where he trained as a miller before buying the village store and postmill in Hindolveston. There he married another Platten, Martha, daughter of an owner farmer from Wood Norton, Samuel Platten, and his second wife Rebecca Sawyer from Foulsham. He had a son in Hindolveston in 1835 and christened James Platten Nurse who married Ester from Swanton and had two children before following his father as miller in Kelling. Ester Nurse born 1868 who married Arthur Wordingham. With Possession immediately or at Michaelmas next. Containing one pair of Stones & Flour Mill with all Going Geers complete, situate in Hindolveston, Norfolk. Apply to Mr. Thomas Pegg, Hindolveston or of Thos. Youngman, Millwright, Letheringsett. Thomas Groom age 18. 29 Jan 1831. House of Robert Palmer, The Trumpet, St. Stephen. He went to the mill of Mr Thomas Pegg of Hindolveston and because the fence had not been kept in good repair he ventured too close to the mill and was struck on the head by one of the sails. He died in The Norfolk & Norwich Hospital. Verdict: In manner and by the means aforesaid. A YOUNG MAN of Steady Habits as Journeyman to a MILLER & BAKER; he will board in the house.